ww2dbaseBa Maw was born in Maubin, Burma to U Kye, a government official. He spent his younger years studying in a Catholic school in Rangoon, then went on to attend Rangoon College and Calcutta University in India. He also spent time at Cambridge University in Britain. He became an attorney and gained fame defending the captured rebel leader Saya San, who led a peasant revolt against the British rulers. This case allowed him to springboard into a career in politics. He advocated the importance of self-rule, and ultimately the independence of Burma from British rule. He served as education minister, and in 1937 became the first Prime Minister of Burma. After he left office in 1939, he was arrested by the British on charges of sedition for his opposition for his country to entering WW2 and fight for the British. ww2dbaseThe Japanese invasion of Burma in Jan 1942 saw Burma's entry into WW2. The Japanese freed him and successfully courted for his support. On 1 Aug 1942, he was named the head of the Japanese puppet government in Burma; later that month, he declared war against the Allied powers. Initially, he believed in the Japanese vision of a theoretically independent Burma and helped to spread the propaganda that Japan was in Burma to free the country of western imperialism. He quickly pierced the veil himself, turning uncooperative. Eventually, he turned his effort toward protecting his countrymen against Japanese maltreatment. When the Japanese forces in the region collapsed in early 1945, Ba Maw's government fell apart, and he retreated for Japan. He was captured by American occupation forces after Japan's surrender, and was jailed briefly in Japan before he returned to Burma. 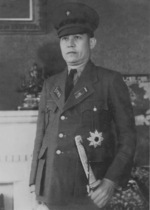 ww2dbaseBa Maw remained in Burmese politics after the war. He passed away in Rangoon in 1977. 8 Feb 1893 Ba Maw was born. 6 Aug 1940 Ba Maw, the pro-Japanese anti-British former Premier of Burma, was arrested for attacking Premier U Pu's policy of supporting Britain in the war against Germany. Ba Maw received a one year jail sentence. 1 Aug 1942 Anti-British nationalist leader Ba Maw installed a Japanese puppet government in Burma. 29 May 1977 Ba Maw passed away.